These versatile INCLINED PLATFORM WHEELCHAIR LIFTS fit into existing stairways. As a result they require very little space and have minimal impact on the building structure and appearance. These wheelchair lifts can carry a passenger in a wheelchair or ambulatory passengers who use a folding seat. STAIRLIFT may be the answer. 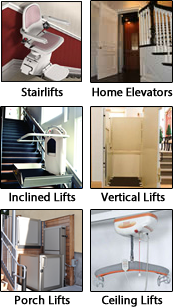 Midwest Accessibility Products sells and services the best residential Stairlifts in the industry. Stairlifts are custom designed for your straight or curving stair case. Save trouble down the line... We are experts in ADA code, and are glad to assist you in your spec writing. Just click here or on the architects tab. NEW STAIR LIFTS INSTALLED WITH A GREAT WARRANTY FOR ONLY $2,595 FOR A LIMITED TIME! Midwest Accessibility Products is proud to sell and service the most technologically advanced products in the industry. Stair lift technology has improved over the last decade, and we've been taking advantage. Whether you need a lift for your home or business, we'll find a model that best suits your budget and your needs. If you or a loved one is unable to move around the house like you used to due to injury or age, don't panic! There's no reason to sell your home or move to a new location. While this decision may be inevitable, our stair lifts can put it off for decades. We have units to service straight stairs and curved stairs alike. Our technicians will make the rail a custom length to fit your needs. We'll make sure to provide room at each landing to park a wheelchair. If you're an architect looking to provide handicap-accessible staircases at your proposed location, we'll help you with high quality specs that conform to ADA code. If you're the owner of a public building, chances are you could increase revenue, garner sympathy, and diversify your clientele by becoming handicap-accessible. Your stair lift repair, maintenance, and installation are hassle-free with Midwest Accessibility Products. Peruse our selection of lifts online, come in, or call for consultation.